This time, we will present you a two-day tour. 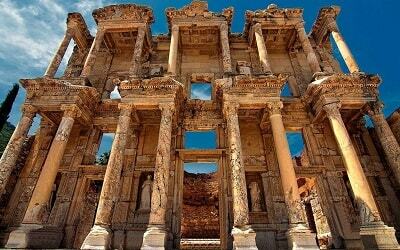 We will discover the beauties in Ephesus and Pamukkale in 48 hours from Fethiye. 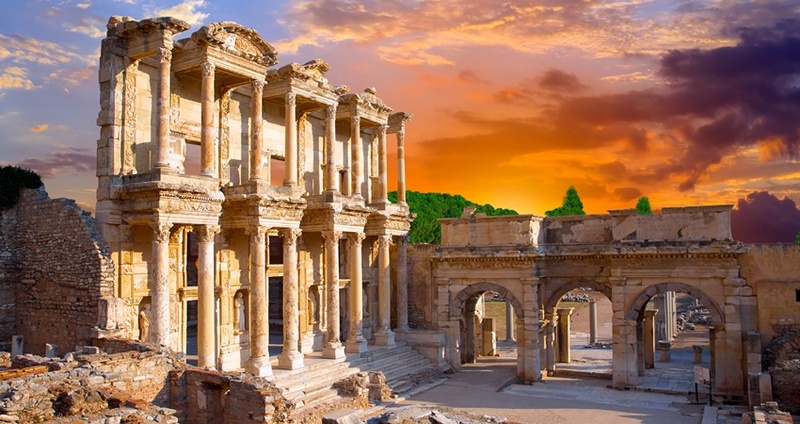 Our dream-like Fethiye Ephesus & Pamukkale Tour has two amazing and incredible destinations to be visited. This tour will offer you a chance to discover more about Turkish culture, countryside and traditions. While exploring around, you will learn a lot, discover a lot, and have fun a lot!! On the first day, we will head to the ancient city of Ephesus. 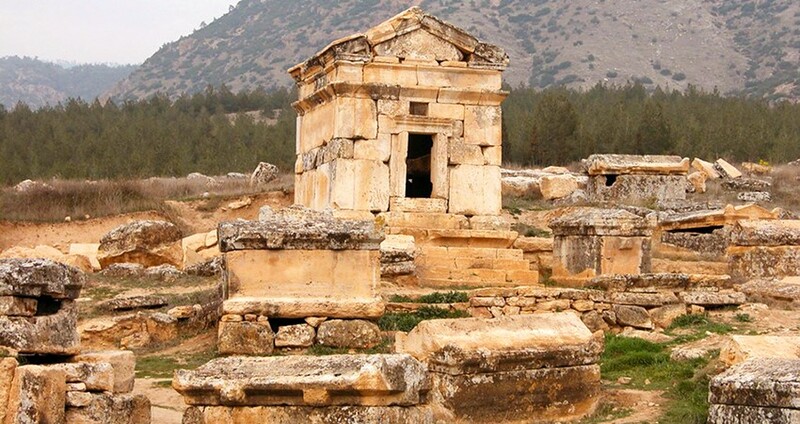 This ancient city bears a lot of mysteries to be discovered by you. 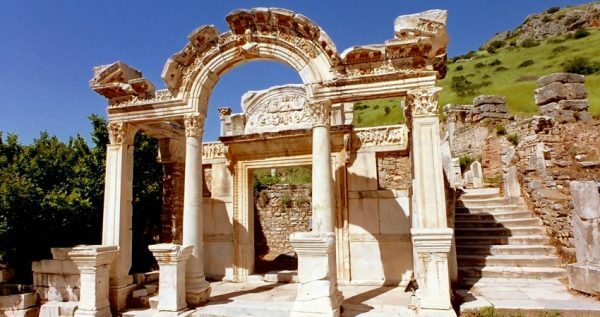 Once it was the home of ancient Roman Empire, and now, it is a beautiful and unique historical location in Turkey. You will see the perfectly preserved remains of Hellenistic and Roman settlements. While exploring around, our kind guides will be more than happy to explain you more about them. 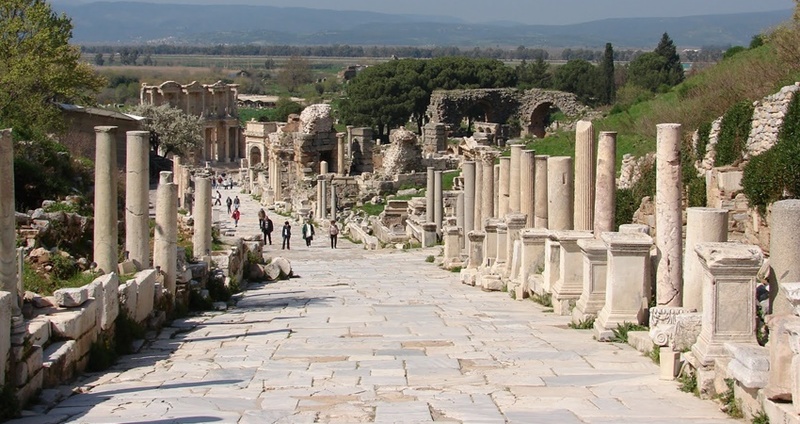 You can visit the marvellous temple of Artemis, which is accpeted as one of the seven wonders of the ancient world. After Ephesus, we will have optional sites to visit or just get your self a break.One of these optional sites is the House of Virgin Mary. This sacred place is a very important location for Christianity, and attracts many people every year. You will feel the peaceful and sacred environment of this place as soon as you step on. At end of the day we will drive to our hotel in Pamukkale for an overnight stay. On the second day, we will visit the marvellous Pamukkale, which is a white heaven in Turkey. 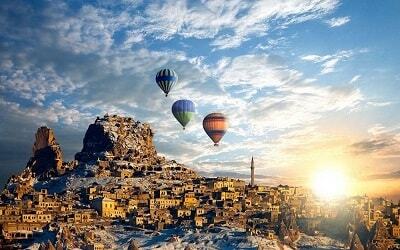 Its name means “The Cotton Castle” in Turkish, and it really looks like one when you look at it. It is such a natural beauty that you will never forget its enchantment after witnessing it. This place will give you a chance to escape from the stressful daily routines of ordinary lives. You can swim in warm mineral-water pools and relax in them. In the same location, you can also treat yourself in Cleopatra’s pool. 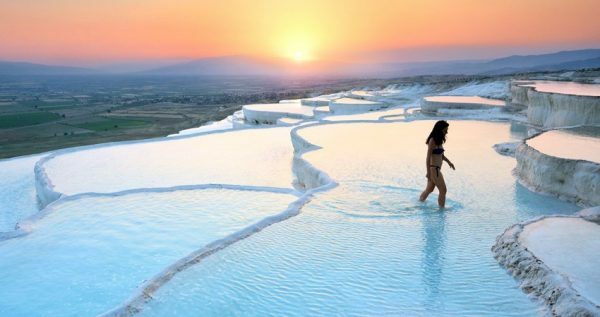 As the water in Pamukkale and Cleopatra’s pool has skin-reviving qualities, do not miss the chance of getting in! However, you can also take a walk around them, breathe the fresh air and feel the relaxation, if you do not feel like swimming. Be sure that you will leave this place with unique and unforgettable memories. 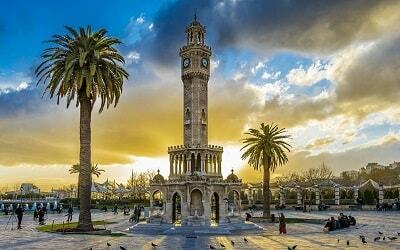 In just 48 hours, you will discover many beautiful destinations in Turkey. Each of them are very special and unique and you will remember this trip with a smile on your face after you go back to your countries. This will be a chance for you to explore Turkish culture more, and it will be a great chance to relax. Towels, Swimming Costumes, Sun Cream, Sun Glasses, Camera, Comfortable Clothing, Comfortable Shoes, Hat, Overnight Bag. It will be a hard day for our guests with walking difficulties. Keep some snacks and bottled water with you as its is 2 long days. 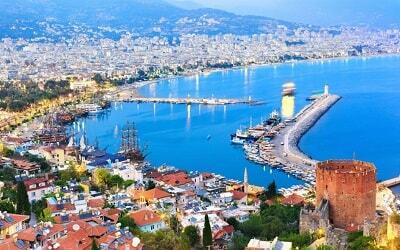 You can find all available Excursions in Fethiye from here. Fethiye two days tour will start with an early pick uo from your hotel. Our drivers and guides buses will be waiting for you in front of your hotels between 06:00 / 06:30 to pick you up according to your hotel location. In the morning, we will stop in a special location that you can have a delicious breakfast. In this place, you can taste traditional foods and have a break from your journey. This will be an energizing moment for the rest of our amazing and enjoyable tour. After a couple of hour drive, we will give a comfort break. You can use the restrooms, or you can shop for snacks. Our polite guides will inform you more about this during the trip. 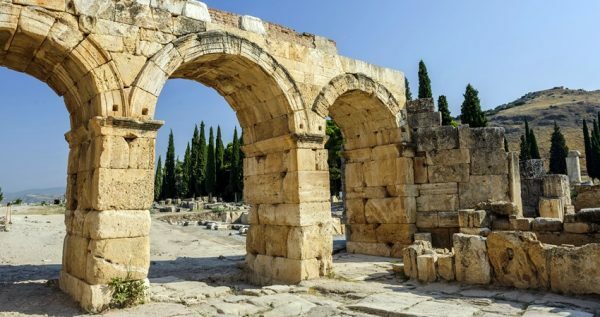 This ancient place has a lot of mysteries and secrets to be discovered by you. 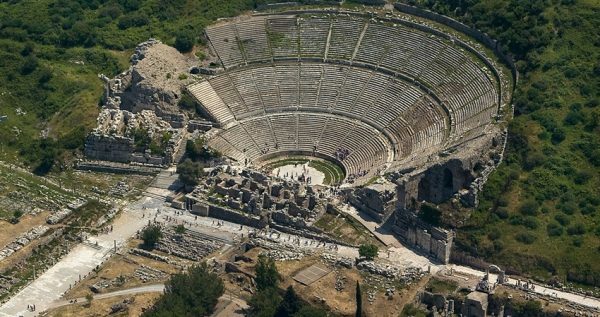 It carries the traces of different cultures such as ancient Greek and Roman culture. Ephesus was once the home of many Greek gods, so it will be a chance for you to learn about them. While walking around, our kind guides will explain and inform you about the historical sites. 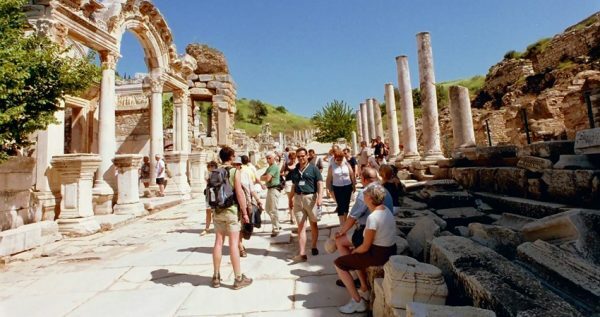 After our visit tp the ancient city of Ephesus and Lunch break, you will have some optional sites to visit in the Turkish town Selçuk. 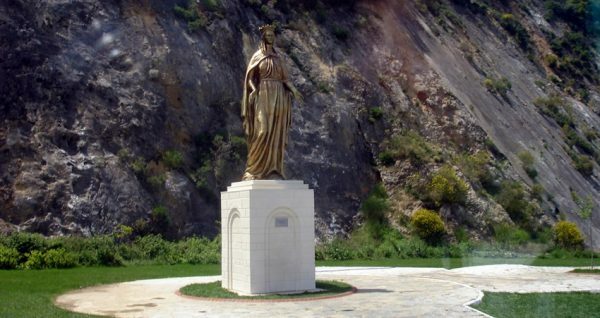 One of the most popular place among all is the the House of Virgin Mary. This marvellous atmosphere hidden in green will welcome you with peace. It is believed that, this is the place Mary spent her last days. 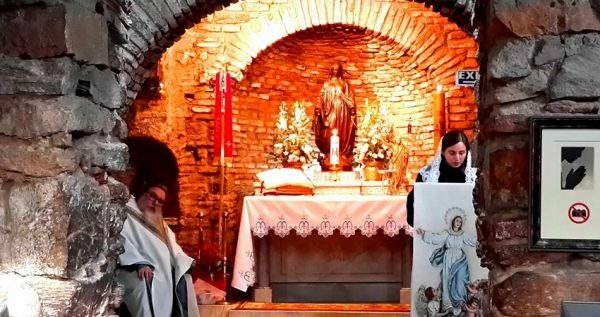 As a result, it became a sacred place for her believers, and it attracts a lot of people from all over the world every year. You will be enchanted by the environment here, and our guides will explain you more, when you arrive there. After completing our first day at the ancient city of Ephesus and town Selçuk, we will take you to a comfortable hotel in Pamukkale. A delicious dinner will be waiting for you. After dinner, you may have a rest at your comfortable rooms or you can use the hotel facilities. 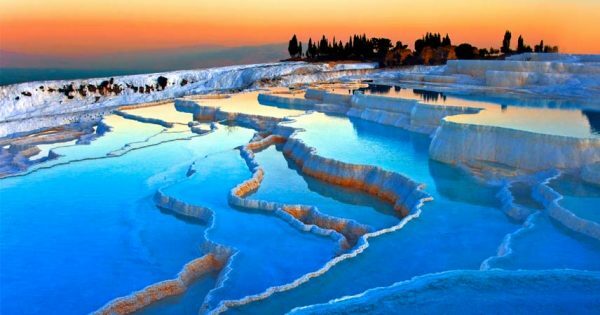 In the next morning, we will head for the splendid Pamukkale, after having a traditional and delicious breakfast at the hotel. This will be the most unforgettable part of your tour. Pamukkale is a miracle and it is officially declared as a “World Heritage Site” by UNESCO. You will witness how amazingly nature shaped itself here when you see the snow-white travertines. In addition, you will also have the opportunity to visit Cleopatra’s Pool here. 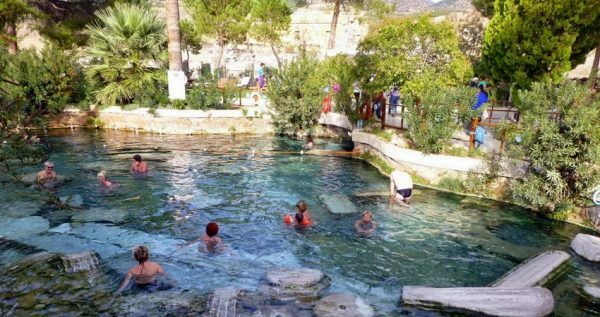 As the water in Cleopatra’s Pool and in the travertines has skin-reviving qualities, do not miss the chance of diving in! Onyx is a local marble-like material. The masters give shape to them magically, and you will be amazed when you watch them shaping. When we stop there, the local gudies will inform you about this material more. After visiting the Onyx Workshop, we will head for Fethiye again. During the journey, everything will be thought beforehand for you. However, if you need anything, do not hesitate to inform our guides or drivers.